The life that will be shared together for a lifetime is crowned with a magnificent wedding ceremony. This is the dream of anyone who wants to get married or who is about to get married. But before the wedding, the engagement ceremony is performed and couples begin to get to know each other better. Engagement ceremonies in recent years are almost held in the concept of the wedding. Special invitation, special dinners, gifts and a wide range of ceremonies are organized in the concept of entertainment. And definitely, custom design ring as an engagement gift is the most impressive part of this ceremony. To design custom engagement rings is the most important choice for couples. These rings use different designs, colors, and models for men and women. It is fully prepared for personal use. This question is one of the most difficult questions for men. Because it’s usually a matter of interest to women, and men want women to do that choice. As before, round cut and standard rings are no longer used. There are so many different and different ring models that you can find it difficult to choose. Tanzanite Engagement Rings, which is the fashion of recent years, are very popular now and most of the couples prefer these rings. (You can read more about this ring model in the following paragraph.) When ordering the engagement ring, first the finger measure is taken and it is decided which stone to use with the joint decision of the couples. Gold, diamond, tanzanite or other gemstones can be used. Engagement rings are sold as a set. These rings can be personalized and prepared according to the desired size. Bride candidates prefer stone, ornate and patterned rings, while groom candidates prefer more simple models. It is important that the ring is ergonomic and comfortable. Among the preparations for the engagement ceremony, the most exciting moment, during the selection of engagement rings can be experienced. Couples want to reflect their favorite designs on these rings. Sometimes they even print a poem, a beautiful love speech, the names of the bride and groom, the date of engagement or something like that, on the back of the rings. To Design custom engagement rings even though it looks simple, it’s not as easy as it seems. (Especially for women). Couples sometimes want to transfer their feelings to their engagement rings and make their designs according to them. The important thing here is the harmony of the rings with the fingers. The Tanzanite Stone, first discovered in 1967 in Tanzania, is a rare subtype of the Zoisite stone. It is a bright blue, greenish blue and purple color. This stone has been one of the most popular trends in recent years with the processing and application of engagement rings. Tanzanite Engagement Rings have become a favorite of engaged couples and are one of the most frequently used special designs. White, yellow and red gold can be blended and customized designs can be made. For those who want to wear an unusual ring at the engagement ceremony, this is an ideal choice. It is rumored that tanzanite stone is also good for various diseases. This precious stone, especially known for its positive energy, can also increase the love and passion between the engaged couples. Since the tanzanite is a very soft stone, you must be very careful during use. It’s a little softer than other stones. Can be designed according to the shape you want and can be adjusted according to finger size. Would you like to take a look at that mysterious world of diamonds, the passion of every woman and the jewel she cares most about? The diamond, which comes from the Greek word “Adamas”, is made up of carbon, the hardest material in nature. For centuries, it has always been the first among the indispensable jewels of women. It is one of the most expensive stones in the world with its dazzling glow, magnificence, and majesty. Due to its hardness properties, it is a mineral that is not damaged under the soil. Diamond cut used to be made with diamonds. But with the developing technology, it can now be cut off with a laser. It is a hard-drawn and solid material. Starting from the 19th century, it was started to be processed as a precious stone. 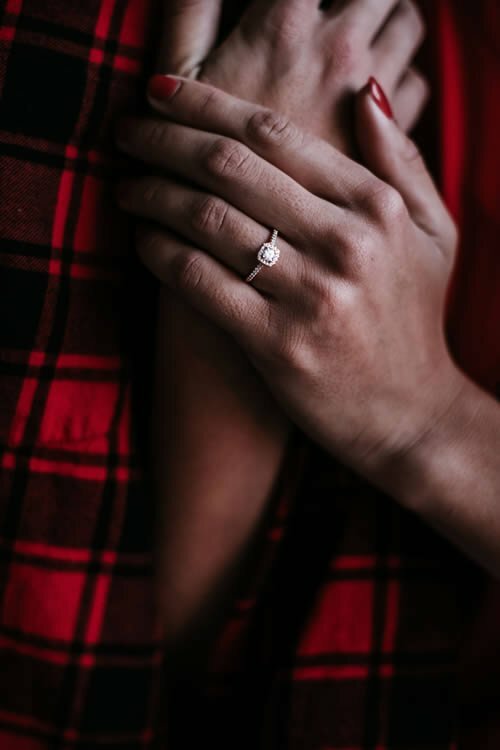 Due to the special interest of women in diamonds, in the wholesale diamonds loose market has created a huge potential, especially in the last 50 years. Today, diamond trade is in the heyday period because of the interest of women. Diamonds symbolize strength for women. It is also one of the most attractive and exotic jewels. It has an aphrodisiac effect on women. It’s appearance, power, and glow turn women’s heads. The diamond represents elegance. Diamond is also a symbol of love. Because having a strong disposition of the diamond means strong love. The relationship between women and diamonds is so passionate that it never ends. When women buy diamonds, they often prefer wholesale diamonds loose stores. One of the biggest reasons for this is that they can choose between the more affordable price and more variety. A loose diamond means, diamond ready for sale. It is the processed form of raw diamond material and is usually used in jewelry such as necklace tip, earring tip, and ring. Women can use it in many jewels and evaluate it in a very different way. In addition, adapting to different models and shapes is the preferred reason for women. Prices may vary by size. You can even order according to your own preferences and make custom production. No matter how the shape and size of the diamond is, the love of women always continues. Even a small piece of diamond is enough to make them happy. Diamond is a jewel that caresses the woman’s soul. Diamond is not a jewel that everyone can understand the quality of. If you are not familiar with this, we strongly recommend that you shop at a store that you can trust. Especially when you buy wholesale loose diamonds, examine the diamond you will buy. 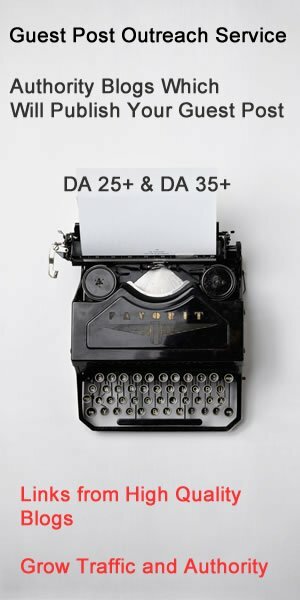 The diamond certificate should be the first criterion to be considered. When you purchase a certified product, you are assured that it is inspected by the gemology laboratory. So it prevents you from buying fake diamonds. But remember, some labs may not be as reliable as you think. Just because the diamond is too big doesn’t mean it’s quality. After you decide how to use the diamond, buy it. You can buy loose diamonds online such as Petra Gems. There’s nothing to worry with that. But you only have to choose the stores you are sure. If you buy directly from the store, you can check whether it suits you and buy it by sight. Both buying ways are also convenient. Choose the diamonds that excite you, suit you and express your love. Rather than the price, it is more important to suit you. Don’t expect to be given to you by a man. Indulge yourself! Ms. Chutima Boonyaprapatsorn, Deputy Commerce Minister has revealed that the 63rd Bangkok Gems & Jewelry Fair held under the theme of “Thailand’s Magic Hands: the Spirit of Jewelry Making” on February 20 to 24, 2019 at Challenger Halls 1-3, IMPACT, Muang Thong Thani experienced great success, with sales generated at the event totaling more than 2 billion baht (63 million USD). 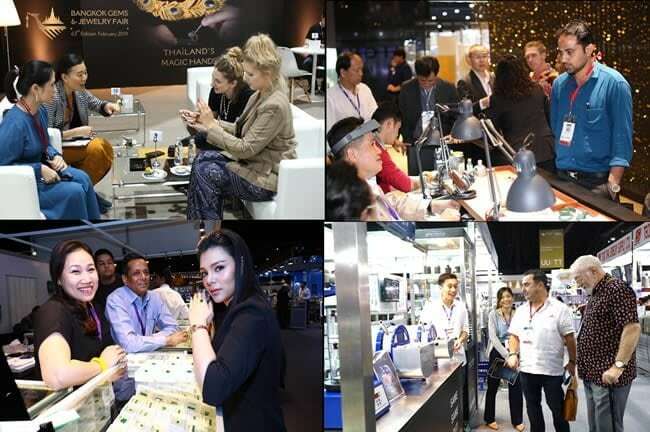 Buyers and visitors from overseas appreciated the intricate craftsmanship of Thai jewelry as well as the high quality of jewelry production which has led Thailand to be recognized worldwide as one of the world’s gems and jewelry hubs. Exhibitors at the fair met Thai and foreign buyers which offered them more opportunities to establish new networks and seek trade partners. The 63rd Bangkok Gems & Jewelry Fair welcomed over 14,000 visitors from 118 countries from around the world, with the number of foreign visitors up 5.4 percent from the same period of last year. 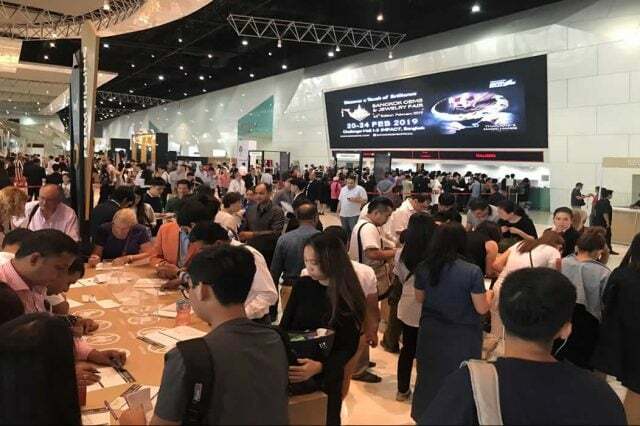 Trade generated at the event was nearly 2.1 billion baht (66 million USD), with immediate sales worth 700 million baht (22 million USD), up 85.2 percent compared to the Bangkok Gems and Jewelry Fair held in February 2018, while public days saw sales of approximately 360 million baht (11.4 million USD). Products with the highest value of trade at the fair were gemstones, fine jewelry, silver jewelry, machinery, and gold jewelry, respectively. 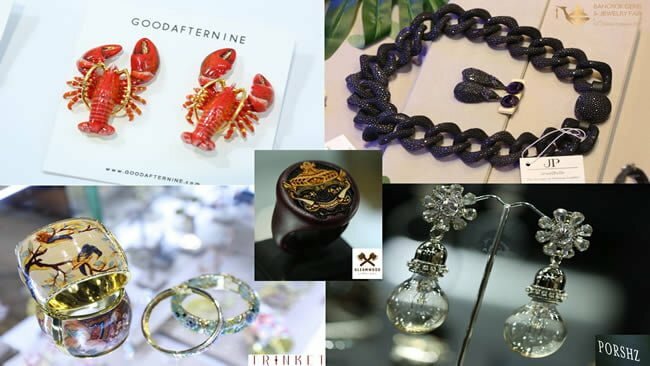 The Bangkok Gems & Jewelry Fair served as a platform for buyers and sellers to trade quality products in a secure atmosphere that matches world standards, and to hold business matching activities with quality exporter. Moreover, visitors enjoyed new product showcases and creative exhibits, for example, The New Faces which featured jewelry products from 123 SMEs manufacturers and designers nationwide from 21 provinces, such as Chantaburi, Tak, Sukhothai, Chiang Mai, Lampang, Pichit, Surin, Prachuab Khiri Khan, Nakon Sri Thammarat, and Phang Nga; and The Jewellers and Innovation and Design Zone, both of which demonstrated quality products that received good feedback from visitors, as well as generated over 120 million baht in sales during the event. The Deputy Commerce Minister added that in the past year, exports of gems and jewelry from Thailand have been expanding in almost all markets. Last year, export of gems and jewelry products excluding unwrought gold was worth 7,606.45 million USD, up 6.96 percent, with high-growth products including gold jewelry, silver jewelry, imitation jewelry, and diamonds. Key export markets were Hong Kong (-1.17%), the U.S. (+15.72%), Germany (+16.24%), India (+2.23%), Belgium (+8.19%), while secondary markets with promising growth included Qatar (+103.49%), Singapore (+38.92%), South Korea (+36.98%), Lichtenstein (+25.04%), and Israel (+20.61%). Moreover, this year, Ministry of Commerce focuses on developing the competitiveness and marketing for this industry by carrying out communications campaigns to promote the image of the industry to be recognized among buyers, importers, as well as increase the awareness of consumers with projects such as the Buy with Confidence campaign by the Gem and Jewelry Institute of Thailand (Public Organization) or GIT, along with the promotion of the industry image in overseas markets through the “Thailand’s Magic Hands: The Spirit of Jewelry Making” by the Department of International Trade Promotion. Moreover, the DITP is uplifting the Bangkok Gems & Jewelry Fair which is a platform for businesspeople, buyers, sellers in the gems and jewelry industry to expand their businesses in many dimensions from material sourcing, trading, and network-building, as well as working to expand online trade channels for gems and jewelry products through platforms such as Ali Express and Thaitrade.com. The Ministry of Commerce is also focusing on Super Rich targets in the ASEAN region, South Asia, and China, while expanding niche products such as jewelry for millennials in China, Japan, and the US; jewelry for pets among aging societies and singles; and jewelry relating to belief and opulence. Moreover, the ministry aims to develop The New Faces business operators to promote the manufacturing of a wide variety of products from Thai SMEs nationwide to enter the international gems and jewelry market. The 64th Bangkok Gems & Jewelry Fair will be held from September 10 to 14, 2019 at Challenger Halls 1-3, IMPACT Muang Thong Thani. For more information, please visit www.bkkgems.com or dial DITP Call Center 1169. 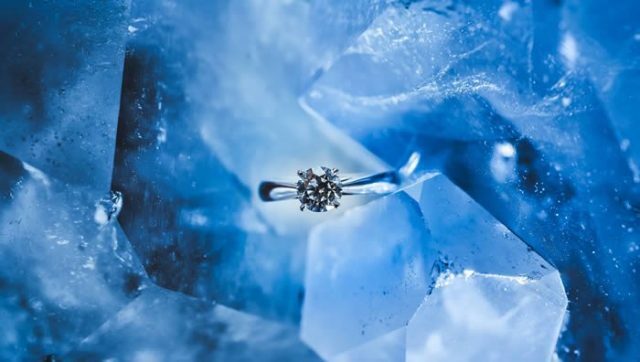 Dutch Diamond Technologies (DD) has created the world’s first ring that is entirely made from a lab-grown diamond. ‘Project D’, DD’s name for the ring, took a year to manufacture and was created in honour of the company’s 10th anniversary. For grading this unique piece of jewellery, DD turned to HRD Antwerp, Europe’s leading authority in diamond grading. DD Technologies has many years of experience in the field of high-tech applications of diamonds. 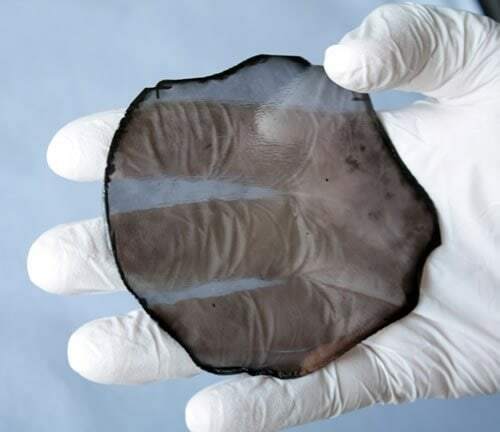 DD Technologies uses both lab-grown diamonds and natural diamonds to cut diamond spheres, optical windows, tools for intraocular implants and a wide range of research-related diamond tools. The company, based in Cuijk in The Netherlands, is known to make tailor-made diamond products and the complete production process is handled in house. HRD Antwerp is the European leading authority in diamond grading. 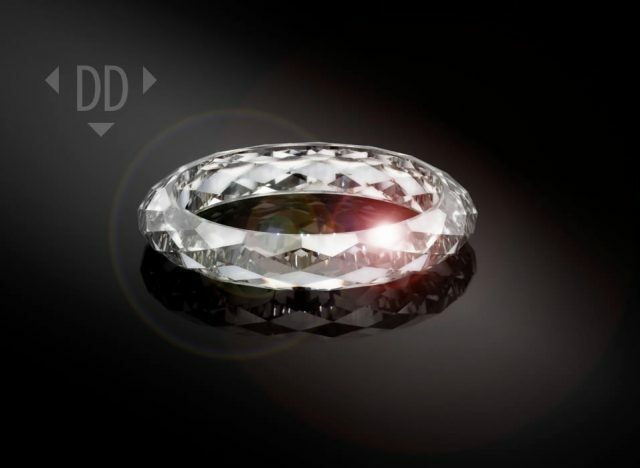 An HRD Antwerp grading report represents the hallmark of authentic European quality and provides consumers with confidence and peace of mind when purchasing diamonds or jewellery. Our diamond laboratories in Antwerp (HQ), Mumbai and Istanbul use the most sophisticated technology and rely on the extensive expertise of our in-house research department. HRD Antwerp also develops and commercializes screening, examination and manufacturing equipment for the benefit of the diamond industry and trade around the globe. Likewise, we organize international courses in various industry disciplines, create tailor-made programmes and offer individual coaching. Next to its diamond labs, HRD Antwerp also has representative offices in Spain, Italy, Israel, Dubai, Hong Kong, Shanghai and Surat. Please note that although we do offer laboratory-grown diamond grading reports, we never grade undisclosed lab-grown diamonds. Gemporia welcomes again sixth-generation pearl dealer Charlie Barron between 15th and 17th February with a group of luxurious pearl jewelry created completely for Gems TV. Pearls have all the time been a agency favorite at Gemporia and Charlie Barron’s reveals this February characteristic a few of his best items up to now that includes earrings, rings and pendants in rose gold, gold and sterling silver all utilizing the very best South Sea pearls and at surprisingly inexpensive costs. 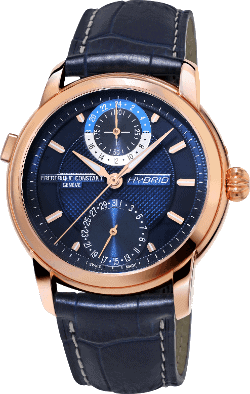 At Frederique Constant we have always intended to bring high qualitative watches at a more affordable price. 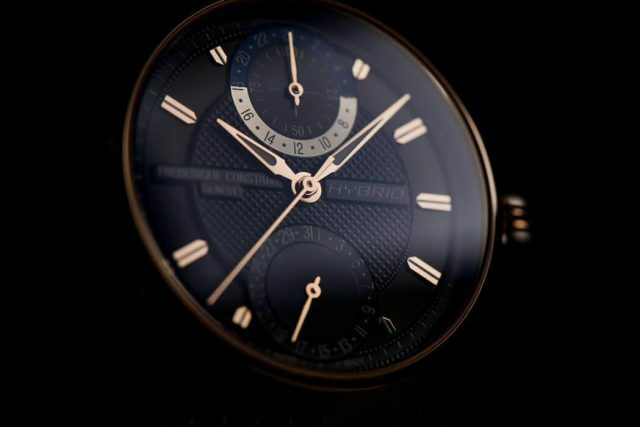 Since 2018 the brand has created an entirely new watch category in the Swiss watch industry by combining traditional horology with ultra-tech modern smartwatches launching the Frederique Constant Hybrid Manufacture, an unusual mixture of a classical automatic movement and a smartwatch module. 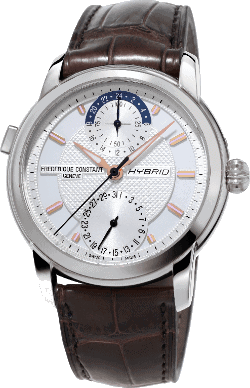 At first glance, one might think that the Hybrid Manufacture is just another Swiss watch. Quite the opposite! Thanks to a classic and beautiful case and dial, the Hybrid can be worn easily, adding elegance to any wrist. But behind this timeless appearance lies a mechanical calibre with great connected functionalities. A connected module allowing different activities such as activity tracking, defining your objective like number of steps per day, quality and quantity of sleep, dynamic coaching (getting suggestions, tips and information tailored to your personal activities and goals) and a worldtimer (second time zone or local time in a 24h format). 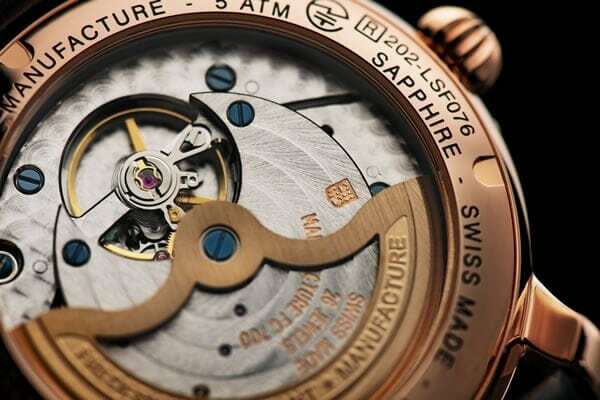 A calibre analytics functionality that measures rate, amplitude and beat error of the manufacture automatic movement. All the results are communicated to the Hybrid App via Bluetooth and can be seen in the form of graphics over time. The Frederique Constant Hybrid Manufacture comes with three new models and two dials versions. A silvered dial for the polished stainless steel and rose gold-plated version and a navy blue dial in the steel rose gold-plated watch. 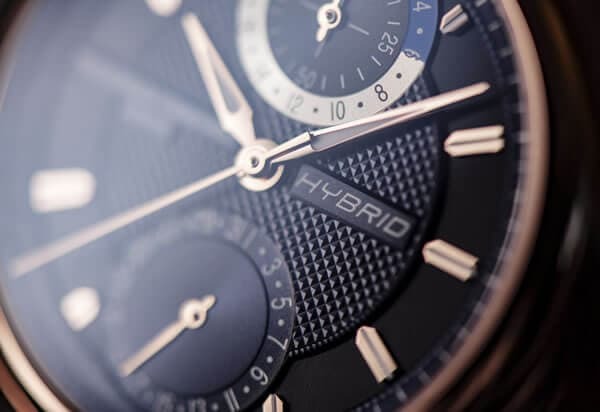 The Hybrid family is fitted with FC-750V4H6 automatic Manufacture Hybrid caliber and a 38-hours power reserve plus a 7+ days battery life for the connected module that can be linked to its Hybrid’s companion application available both on Google Play and Apple Store. All collected data is saved each time one opens the app thanks to a dedicated Cloud hosted securely on a Swiss protected server. The movement is finely enhanced with Perlage and circular Côtes de Genève decorations and the dial boasts hours, minutes, seconds, as well as a date and connected counter in a 42 mm unique case size. The Hybrid Manufacture is delivered into a luxurious wooden winder box offering a removable charger for the electronical Smartwatch functionality and a winder rotating box that charges the barrel in the mechanical caliber. The removable charger can be taken out for traveling. By a simple USB cable, the Hybrid Manufacture watch can be charged anywhere out of its wooden winder box.